Have you ever felt the need of having multiple blog pages on your WordPress website? If you did, then it can be because you have many multi-niche blogs floating on your website or you are planning specifically on launching a blog targeted on multiple topics and areas. The first one is direct and will provide you with the primary process to have multiple blog pages in your blogging website and the second will provide you with the multiple blog page setup and on top of that, you can do more customization to your blog design and layout. All right, we will first have a look at the way without any customization and then we will try the way with design options. Well, if you look at it, you will not be technically creating multiple blogs but you will be creating multiple blog pages in one WordPress website. This can be done by anyone even if you do not have any formal coding knowledge. Step 1: You need to add categories to your blogs. So, for that login into your WordPress Dashboard. Step 2: Now, go to Posts > Categories and add the categories in which you want to bifurcate your blog using the “Add new category” section. Just enter the category name, the slug, and enter other details if needed and then click on the “Add new category” button. Repeat the above step for the number of “Blogs” that you want on your website. Step 3: Now go to Appearance > Menus. We will now add our categories to the menu. Step 4: Now on the left side, you will see the list of sources that you can add to your menu. Click on the “Categories” drop down and select the Categories or “Blogs” that you have created and then add the list to your menu by clicking on the “Add to menu” button. Rearrange the categories if you want by dragging and dropping the menu item up and down in the menu arrangement. You can have a different navigation label as well by editing the menu item. 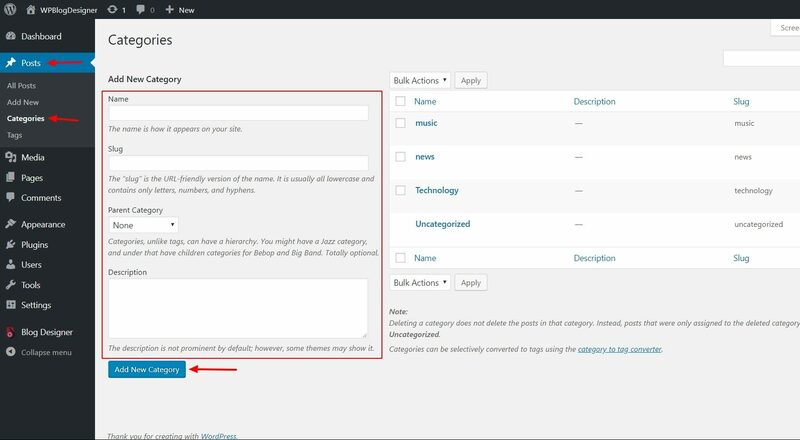 Step 5: If you have not published any blogs yet, then you can start posting your blogs and adding their category accordingly and the blog post will automatically be displayed in that specific category. If you already have blogs published on the website, then you can use the quick edit option on the blogs list page and edit the category of the blogs. This was the non-customization way. Now we will have a look at how you can make multiple blog pages on your WordPress website with second method. In the second method, we will require the Blog Designer Pro plugin. This amazing plugin will give you the option to add the categories to the list without touching a single line of code. The Blog Designer plugin has 2 variants Lite & Pro. You can go for either version but for this feature, we need the Pro version. You can get here Blog Designer Pro version. Creating multiple blogs layout is not the only thing Blog Designer Pro can do but it offers much more customization, and you can do a lot more with the design capabilities it offers. Let’s see the steps to install this plugin. Step 1: First of all, install and activate the plugin on the website. Just go the plugins page and click on “Add new” button. Now click on the Upload Plugin button and look for the Blog Designer Pro.Zip file and then click on “Install now” button. Once the installation is done, click on the “Activate” button. You can refer to this video for the complete installation process of Blog Designer Pro plugin. Step 2: Just like we did in the previous process, we will require to add the categories for the blog posts here as well. 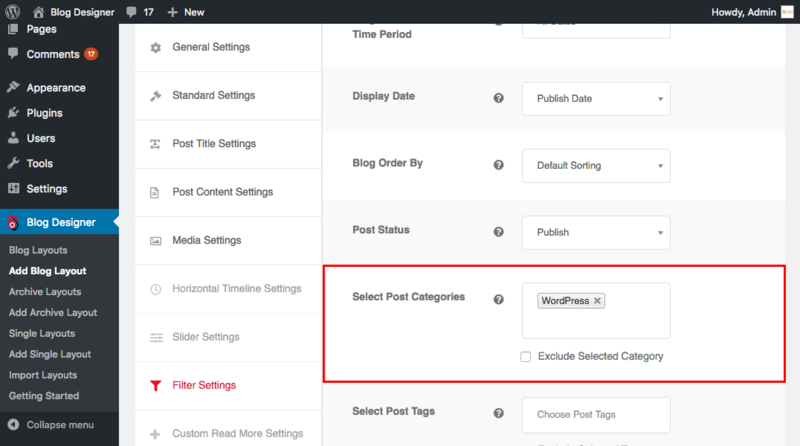 For this, go to WordPress Admin Dashboard > Posts > Categories. 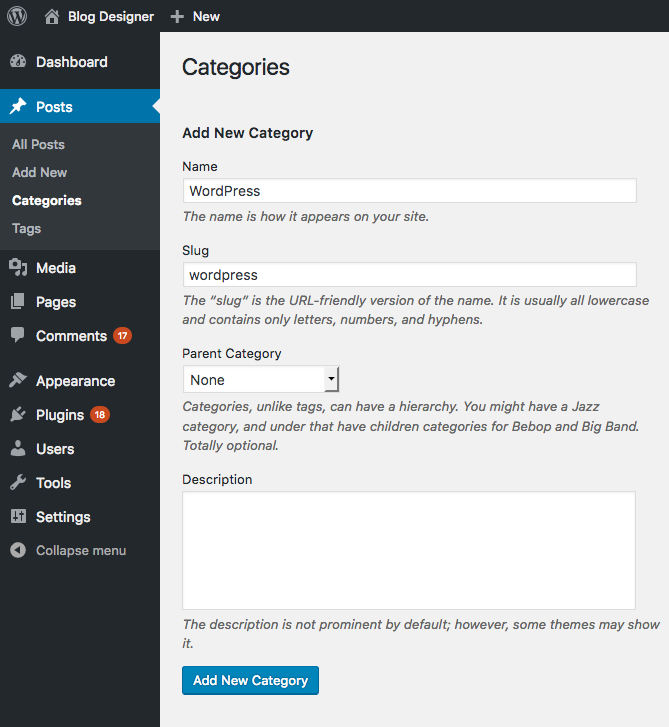 Step 3: Use the Add Category section to add new categories to your blogs. Remember, categories will be the “Blogs” that you want to make on your website. Add a new category for every new blog you want on your website. Step 4: If you have existing blog posts, go to posts and change the categories of your blog post to the ones you have made. Remember, posts will be bifurcated by the categories, so change the blog categories in the same way you want your blogs to appear. Step 5: Now, since we need pages to display on our “Blogs” or categories, we need to create pages for the same categories as well. For this, go to Pages > Add New and add the same number of pages as of your categories. You can set your page name to same as of your categories for easy referencing. Step 6: Now click on the Blog Designer Pro tab and click on the Create new layout button. Step 7: Select a layout from the list of templates by clicking on the select template button. You can further change the template color preset by clicking on the respective radio button. Step 8: Give your layout a name (it can be category name). Then go to filter settings. Step 9: In the filter settings, look for “Select Post Categories” option and select a category from the list. 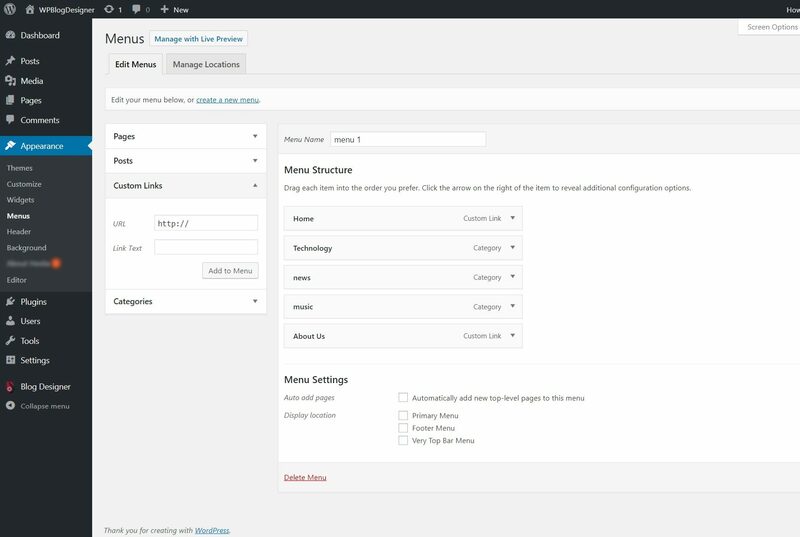 Step 10: (optional): You can make other changes to the blog designs using the other settings of the Blog Designer Pro. You can alter the whole design of your blog page, and you can choose your favorite design from its 40+ blog design templates. Once you are done making changes, just click on the save changes button. 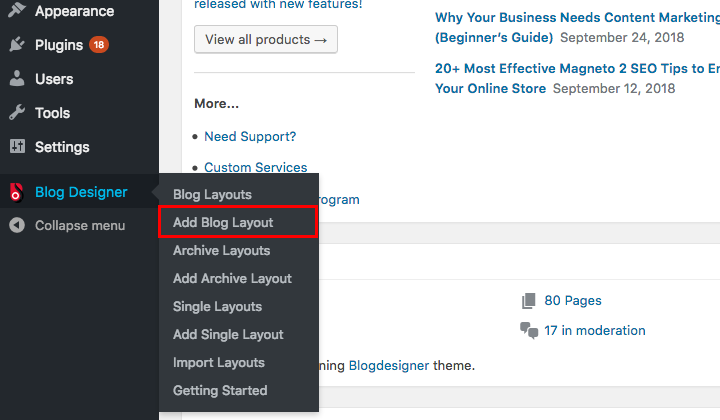 Step 11: Go to Blog Designer Pro > Blog Layouts. Look for the layout you have created and then click on the “Duplicate” button. This will open the duplicate blog design. Step 12: Now you need to change the page for the layout to be applied on and change the “Category” in the filter settings. Click on the save button. Step 13: Repeat the steps for the number of “Blogs” you want on your website. Step 14: Now we need to add these pages to our menu. Go to Appearance > Menu. Create a new menu if you do not have one, or you can edit an existing menu. Select the list of pages from the list and check the pages you have created. Now click on the Add to Menu button. Thats it! You have finally found your way around creating multiple blog pages on a single website. You can publish your future blogs and add them to the categories, and the blog will automatically be published in that specific “blog page”. Out of the two options, the first one does provide a quick solution, but it lacks out when it comes to design changes. If you are looking for creating multiple blog pages on a WordPress website, but you also want to take your website design to another level, then you can go with the Blog designer Pro. This will give you total control over how your blog page looks and functions. Tell us which process did you like the most? If you have any questions, do leave a comment down below and we will get back to you as soon as possible!